America Revealed: Why Are Police Attacking Peaceful Protesters? Why Are Police Attacking Peaceful Protesters? As the number of Occupy Wall Street arrests nears 1,000, instances of police brutality continue to pile up. Felix Rivera-Pitre was punched in the face in New York during a march through the city’s financial district; Ryan Hadar was dragged out of the street by his thumbs at Occupy San Francisco; and at Occupy Boston, members of Veterans for Peace were shoved to the ground and dragged away for chanting and peacefully occupying a local park. "This is not a war zone. These are unarmed people. It does not make you tough to hurt these people. If you want to go fight, go to Iraq or Afghanistan. Stop hurting these people, man, why y’all doing this to our people? Why are y’all gearing up like this is war? There are no bullets flying out here." Police repression in America is hardly new. Low-income neighborhoods, communities of color and political activists have always had to deal with unneccassary shows of force by some police officers. 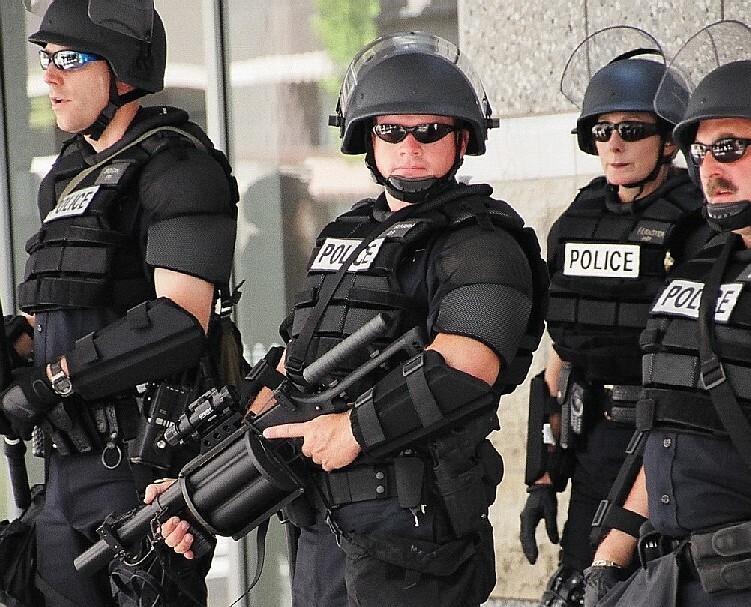 Thanks to a populist uprising threatening a status quo that benefits the top tier of American society to the detriment of the bottom 99 percent, many Americans for the first time are witnessing the U.S. police state in action. A clear pattern has emerged in the response to occupations throughout the country, from San Francisco to Denver, involving midnight raids by heavily armed paramilitary units of riot police deployed to enforce park curfews. Protesters at Occupy San Francisco are familiar with the routine. They have endured multiple late-night police raids on their encampment in Justin Herman Plaza, the most brutal of which took place Sunday, Oct. 16. Minutes before midnight and with the approval of Mayor Ed Lee (who is currently running for reelection and claims to be supportive of the movement's overall message), 70 police officers decked out in full riot gear marched into the encampment to enforce a 10pm curfew. They dismantled tents, tarps, the medical station and the kitchen, along with some personal belongings, all of which were loaded onto Department of Public Works trucks. Some 200 protesters resisted peacefully, locking arms to prevent the police invasion, which was met with a frighteningly violent response. According to theSan Francisco Bay Guardian, one protester received a lengthy beat-down for duct-taping his body to a pole inside the camp. The police allegedly "ripped him off the pole, threw him to the ground and struck him in the head and ribs. When he left by ambulance a few hours later, he appeared to be convulsing or seizing," reported the Bay Guardian. Protesters using their bodies to block the DPW trucks from leaving were dragged out of the street, some by their fingers and thumbs. Those who locked arms to form a human chain were pulled apart and thrown onto the sidewalk. Ryan Hadar, 19, described his experience to the Guardian: “They bent back my thumbs, trying to pry me away from the people I was locking arms with. When I asked if they were trying to break my thumbs [one officer] replied, ‘Only if I have to.’ Then they dragged me to the sidewalk by my index finger. I asked if they were trying to break my finger, and this time they replied, ‘Yes.’"
After destroying the campsite, sending one activist to the hospital and arresting at least five protesters, the police departed from the scene around 1:40am. Days earlier, an eerily similar situation unfolded at Occupy Denver. Just as Zuccotti Park was celebrating victory over Mayor Bloomberg's failed eviction attempt last Friday, Denver's occupation of Lincoln Park was being dismantled at the request of Colorado Gov. John Hickenlooper. With the combined efforts of the Colorado State Patrol and Denver Police, two dozen protesters were arrested and charged with unlawful conduct on public land. Two weeks ago, protesters at Occupy Boston in Dewey Park faced police suppression in a late-night raid that led to 129 arrests and multiple injuries involving several members of Veterans for Peace. According to the Associated Press, nine protesters occupying Sacramento's Cesar Chavez Park were arrested late Wednesday night for failing to leave the park after closing, bringing the total of Occupy Sacramento arrests to 67. The authorities justify these late-night raids as necessary to enforce park curfews. Yet, even during the day, the mere presence of heavily armed riot police inevitably results in some police action that baffles the mind. For example, Debra Lynn Peardon was arrested for opening her umbrella while seated, a violation of a new city ban on the use of umbrellas as makeshift structures regardless of the weather. With the blessing of Chicago's mayor, Rahm Emanuel, the Chicago Police Department arrested 175 protesters last weekend for refusing to leave Grant Park, the site of Occupy Chicago, citing a violation of the park's curfew. As reported by Joe Macaré of In These Times, protesters showered praise on the Chicago Police Department for showing restraint by arresting them "One by one, and by all accounts as peacefully as possible," in stark contrast to the violent arrests experienced at other occupations. But the jailing of peaceful protesters is wrong, even when carried out free of beatings and pepper spray. This was epitomized by the arrest of Princeton University professor and civil rights activist Cornel West on the steps outside the Supreme Court, where it is illegal to hold a political sign. A ban on political protest outside the halls of the highest court in the country is an ironic symbol of how little regard is given to the First Amendment of the constitution. Occupy Wall Street has revealed to the country and the world an American police state apparatus that rivals most standing armies in both weaponry and magnitude. Later in the morning, the total count had increased to 16 police vehicles, in addition to a number of unmarked cars, most of which proved to belong to police officers, too. Across Broadway and up Liberty Street, the security forces maintained a reserve contingent of 11 police cars, five police vans, and one paddy wagon from precincts all over the city: the 1st, 5th, 9th, 10th, 13th, 20th, 83rd, 94th (Brooklyn! ), as well as the Fleet Services Division which oversees the NYPD’s inventory of cars. This level of overwhelming police presence, along with the disproportionate and combative force directed at peaceful, unarmed protesters, alarms Americans previously unaware of the increasingly militaristic nature of American law enforcement. Rania Khalek is an associate writer for AlterNet. Follow her on Twitter @RaniaKhalek. Legal Rights for Fertilized Eggs? Did Attorney General Holder Lie to Congress? The Great Recession is the Liberals’ Fault-Proof?